I made this DG Patterns Victoria Dress for New Year’s Eve at a friend’s house. I decided to save it to share until now since it fits in well with my posting schedule leading up to The Day and Night Dress Challenge. This dress is a little bit of inspiration for your cocktails look for the challenge. How about you? What do you have in mind for your cocktail look? I loved this dress when Daniela made it last year for The Day and Night Dress Challenge. She was going for her own interpretation of a dress Victoria Beckham wore I think to Wimbledon. While the original dress is a little different (pleats vs gathers), I think the overall architecture and the colorblocking effect of the dress is very similar. The swoopy curves of the colorblocking are really an eyecatching detail. Since I never shy away from colorblocking, this pattern was always something I wanted to make. I don’t always fabric shop with patterns in mind, but I did with this project. When I was in San Francisco, I made sure to peruse the stretch velvets at Fabric Outlet (Cali Fabrics’ brick and mortar store). There I found the navy stretch velvet and the ivory panne velour. I already had this vivid sky blue velour in my stash that I had found as yardage at my local thrift store. You guys, there is a lot of junk that gets passed off as fabric in thrift stores. If you’re consistent and persistent in looking though, you will occasionally find really nice quality fabric. This was definitely the case with this velour. It has a beautiful drape and hand, it was so easy to sew, and the color is like the best kind of warm spring sky. One of the things that makes a colorblocking project successful or not is the choice you make for the placement of the colors. I find sketching a great way to hash out your ideas for color placement without having to cut into fabric. 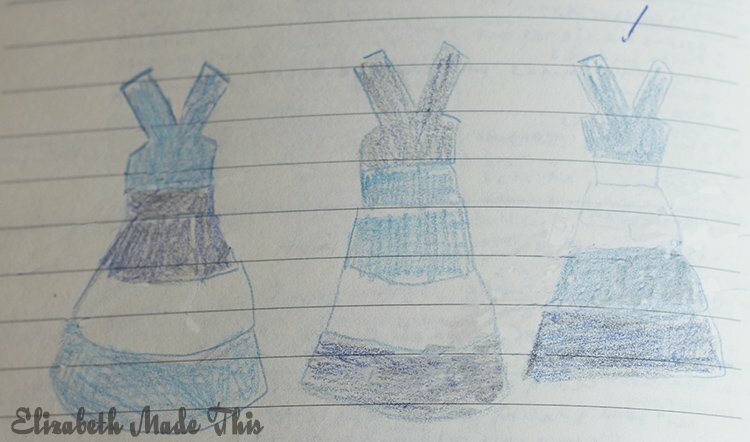 Even a rough sketch like this one I did can really help you visualize what your combination of fabrics will look like. I lined the dress with an aqua ITY knit. The panne velour was slightly sheer, so it needed to at least be underlined. Since the bodice is lined per the directions, adding a full lining was a good choice. Because the skirt is gathered, I narrowed the top of the lining piece to fit the midriff. This cuts down on the bulk in the skirt. I’m a little popsicle in winter! That being said, the stretch velvets and the full lining make for a warmer than average dress. With an undershirt and some fleece leggings and boots, this is not a bad choice for the 45 degree day I took these pictures in. 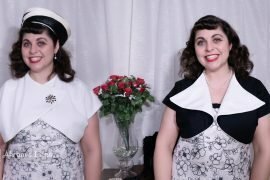 We talk a lot I feel like in the sewing community about knit dresses being secret pajamas, and it’s totally true. How often can you put on a dress that looks as polished as stretch velvet can look and yet feel so immensely comfortable? I personally wish I had fitted the bodice and the skirt a little more because it’s all a little loose for my general taste. That being said, I don’t mind the extra room since I’m wearing it with multiple underlayers for warmth. While my actual cocktail dress will be something totally different, today I wanted to explore the more casual, comfortable side of what a cocktail dress could be for the challenge, much like I did in my coffee dress inspiration post. Stunning Elizabeth! And I love your sketches. Thank you Faye! I forget sometimes how much sketches really help me get my thoughts down on paper, but even very cursory sketches like these really help your brain start puzzling things out! This is incredible and adorable on you! I always look forward to your posts because you are so creative and your pieces are so original! Thank you Ann! It’s a little more cutesy of a look than I’d typically go for, but I really like it, and the colorblocking was so fun to plan out! How pretty! You’re so creative. So cute! It looks lovely on you. Bravo! Thanks Eli! It was a fun one!